Extremely Easy to Set Up and Use This SVAT system functions just like a computer, with a mouse for pointing and clicking and an intuitive icon-based menu that provides prompts and coaching to assist you in navigating the system. It's even so simple to use it will begin recording as soon as it's plugged in. View Your Camera Footage From Anywhere In The World Whether monitoring your business or home, view your footage live online, anytime and anywhere with PC or Mac. You can also view footage on almost any smartphone, including iPhone, BlackBerry, Android, Windows Mobile, or Symbian, as well as on your iPad and most major tablets. Instant Email Alerts If Activity Detected This SVAT system is designed to send you an email alert, complete with photo, if any motion is detected on your property or if any of your cameras experience video loss. 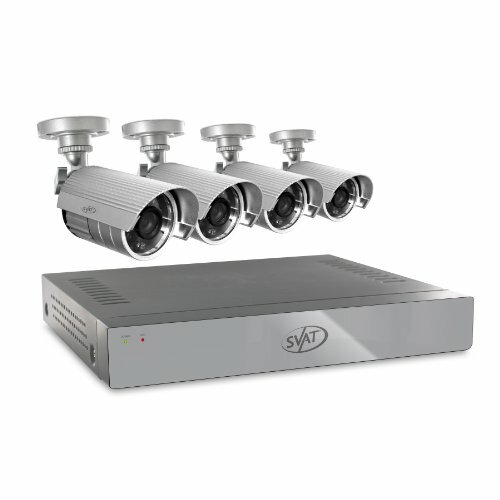 Crisp and Detailed Video You Can Rely On SVAT cameras are equipped with 480 TV lines of resolution and the DVR records in D1 resolution, which is the equivalent of 704 x 480 pixels or DVD quality. The resulting clear, crisp and accurate video feed will help put the criminal away. Two Years' Worth of Footage Storage - and More if You Need It The included 500 GB hard drive allows continuous monitoring and recording of over two years' worth of footage! Your DVR sends an alert when your memory space is full so that you can choose to overwrite old video or stop the unit from recording. The built-in USB port gives you the option of backing up and transferring your video footage with a USB flash drive or external USB hard drive. When Everyone Else is Asleep, Our Cameras Are Watching Closely SVAT cameras are equipped with night vision that automatically activates. Twenty-four infrared ClearVu LEDs provide crisp and detailed night imagery as you monitor from up to 75ft away, even in complete darkness. 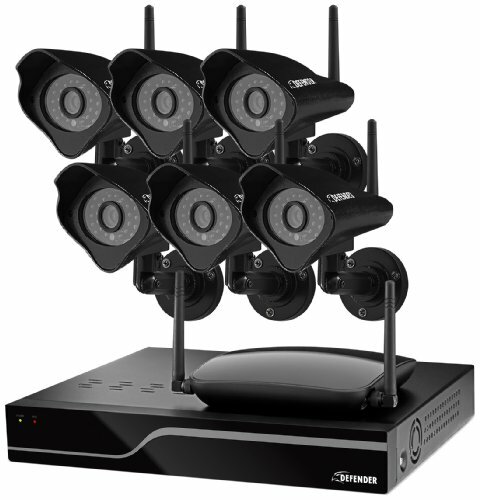 Defender PHOENIX Pro Wireless Security System can be used to monitor video in any indoor or outdoor space at any time of the day. This wireless plug and play system allows for easy set up in a matter of. 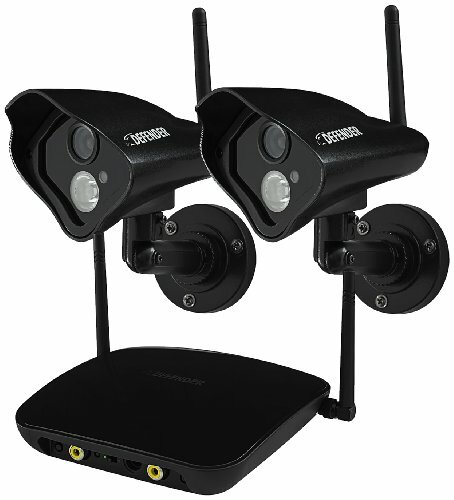 The wireless, weather resistant camera included with this system has one wide-angled array infrared LED that allow you to see up to 100ft away in the dark. Ideal for monitoring entrances, backyards, valuables and employees, this PHOENIX Pro system can be used in any situation you need. Digital Wireless Technology Digital Wireless Technology makes set-up hassle free. This advanced system automatically connects when turned on - no wiring required. Superior digital functionality ensures that the signals remain strong as you monitor your business or home wirelessly, up to 750ft away. Long Range Night Vision See it all in pristine detail, day or night: 520 TVL cameras with 100ft night vision leave nothing to the imagination. The indoor/outdoor camera provides you with a clear, secure picture, even when you monitor after-hours or in a dark location. The camera comes equipped with advanced night vision and 1 wide-angle array infrared (IR) LED that let you see clearly in the dark, up to 100ft away! This high quality array IR LED provides clear and even night vision that is able to cover the camera's full field of vision. The LED activates automatically when it gets dark, and deactivates during the day to save energy (CDS sensor). With this system, you can rest assured, knowing that you will have around the clock protection. True Do-It-Yourself Security Defender Phoenix Pro Wireless system gives you all the peace of mind of a professionally installed system with the satisfaction that comes from knowing you did it all yourself. Don't leave the safety of your property to chance. 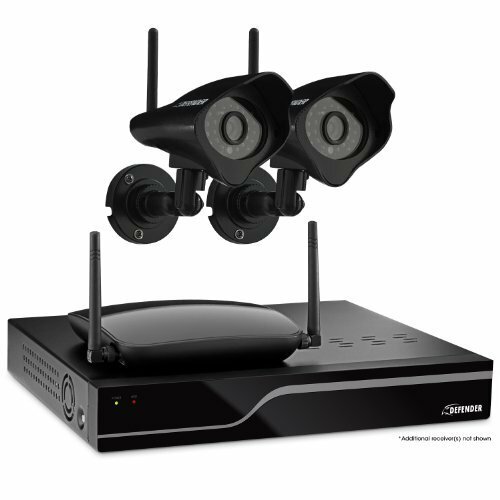 Defender Wireless Security System can be used to monitor video in any indoor or outdoor space at any time of the day. This wireless plug and play system allows for easy set up. The wireless, weather resistant cameras included with this system have 24 infrared LEDs that allow you to see up to 75ft in the dark. Ideal for monitoring what matters most. ClearVu Digital Wireless Technology ClearVu digital wireless technology makes set-up hassle free. This advanced system automatically connects when turned on - no wiring required. Superior digital functionality ensures that the signals remain strong as you monitor your business or home wirelessly, up to 450ft away. Long Range Night Vision See it all in pristine detail, day or night: 520 TVL cameras with 75ft night vision leave nothing to the imagination. The indoor/outdoor camera provides you with a clear, secure picture, even when you monitor after-hours in a dark location. The camera comes equipped with advanced night vision that let you see clearly in the dark, up to 75ft away! The LED activates automatically when it gets dark. Smartphone Viewing in 1 Step Defender®'s free 1 Step Remote Viewing software instantly networks your DVR with the Internet. View your video feeds live, receive instant email alerts and watch any previously recorded footage from anywhere in the world with an Internet connection on your smartphone, tablet or computer. 1TB DELIVERS FOUR YEARS OF MEMORY The included 1TB HDD allows for continuous monitoring and can store over four years' worth of recorded footage. Maximize available memory with motion activated recording and H.264 compression technology. DVR alerts will activate to notify user when HDD is full. Back up and transfer footage to USB flash drive or external hard drive via USB port. 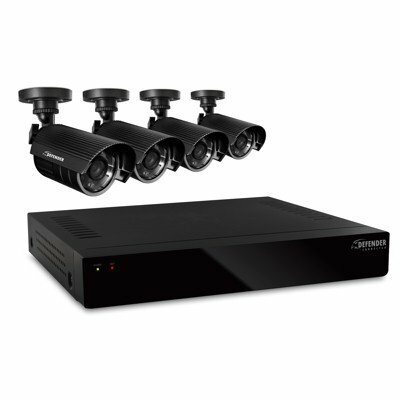 The CLEARVU4 DVR is the perfect security solution for large properties. 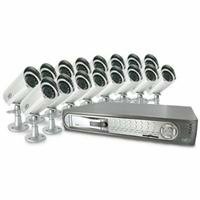 Have peace of mind and protect your assets in your home or business with this deluxe 16-camera DVR system. 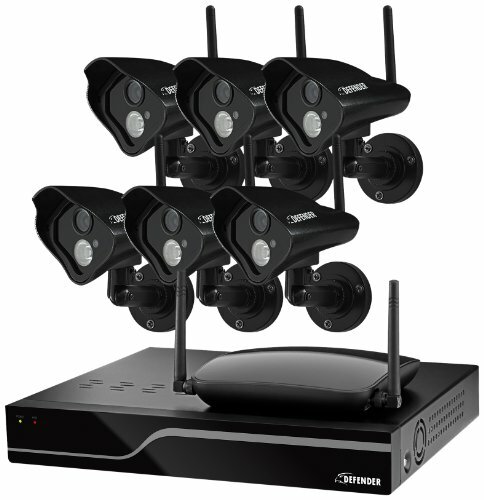 The 16 hi-res cameras included in this system allow you to monitor and record from multiple locations on your property. The weatherproof cameras are ideal for both indoor and outdoor use. The CLEARVU4 DVR has a removable 320GB hard drive that has been designed specifically for DVRs, providing reliable recording and faster playback of your recorded footage. The hard drive will record up to 750 days of continuous video. It will start recording once the DVR is plugged in and will restart automatically after any power failure. A great benefit of this system is the ability to view your home or business while away from the property, from anywhere in the world! The DVR allows you to view all your cameras live over the internet. Simply plug the DVR into your broadband connection to view live or recorded footage, and transfer video to your computer. You also have the option of transferring footage to a Compact Flash (CF) memory card for an easy portable solution. This DVR offers recording modes that you can easily customize to suit your security needs. Motion activated recording will only record when movement is detected on one of your cameras. Scheduled recording allows you to set up a 24 hour schedule that tells the DVR what hours of the day to record. These features will save on DVR storage space and save you time when searching for important footage. Finding your footage is easy - simply enter the date and time range and the DVR will display all the video clips recorded in that time period. Extremely Easy to Set Up and Use This Defender system functions just like a computer, with a mouse for pointing and clicking and an intuitive icon-based menu that provides prompts and coaching to assist you in navigating the system. It's even so simple to use it will begin recording as soon as it's plugged in. View Your Camera Footage From Anywhere In The World Whether monitoring your business or home, view your camera footage live online, anytime and anywhere with PC or Mac. You can also view footage on almost any smartphone, including iPhone, BlackBerry, Android, Windows Mobile, or Symbian, as well as on your iPad and most major tablets. Instant Email Alerts If Activity Detected This Defender system is designed to send you an email alert, complete with photo, if any motion is detected on your property or if any of your cameras experience video loss. Crisp and Detailed Video You Can Rely On Defender cameras are equipped with 480 TV lines of resolution and the DVR records in D1 resolution, which is the equivalent of 704 x 480 pixels or DVD quality. The resulting clear, crisp and accurate video feed will help put the criminal away. Two Years' Worth of Footage Storage - and More If You Need It The included 500GB hard drive allows continuous monitoring and recording of over two years' worth of footage! Your DVR sends an alert when your memory space is full so that you can choose to overwrite old video or stop the unit from recording. The built-in USB port gives you the option of backing up and transferring your video footage with a USB flash drive or external USB hard drive. When Everyone Else is Asleep, Our Cameras Are Watching Closely Defender cameras are equipped with night vision that automatically activates. Twenty-four infrared ClearVu LEDs provide crisp and detailed night imagery as you monitor from up to 75 feet away, even in complete darkness. Feel secure with the DVR that does it all. The CLEARVU1 is a complete security package that comes with everything you need to set up an effective surveillance and recording system. The DVR has an integrated hi-res LCD screen, which includes an LCD on/off switch for power saving. It also comes equipped with a 160 gigabyte Seagate hard drive, which allows you to store up to 40 days of footage. The Seagate HDD has been optimized for the DVR, allowing for faster speed and cooler operation. This DVR is Internet Ready, which means you can view your cameras live from anywhere in the world! You can also play back recorded footage and adjust your DVR's settings over the web, which will give you peace of mind when you are away from your home or business. The web software is easy to install and is password protected, ensuring that only you can access your DVR. 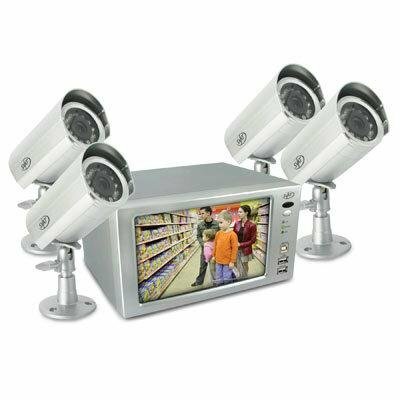 This system comes with 4 outdoor CCD cameras. The high quality CCD image sensors in these cameras provide a clear, crisp and consistent picture. They also allow you to distinguish facial features, which can help in the positive identification of suspects. Each camera is built for the outdoors with weatherproof housing and a sunshade. The cameras also have built-in IR night vision, which allows you to see in the dark up to 15 feet away! This is made possible by 12 IR LEDs that automatically activate when it gets dark (CDS sensor), for day and night viewing. The DVR's menu system is easy to navigate. Use either the included mouse, or control the DVR with the included IR remote. This DVR also supports USB flash drives, for easy transferring and archiving of your recorded footage.